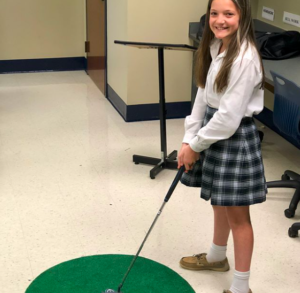 For the next week, students in Mrs. Victoria Williams’ classes will explore quadratics, averages, percentages and costs in golf. 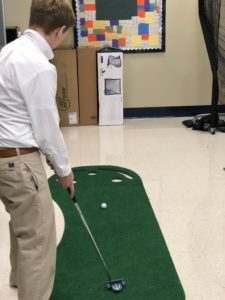 Mrs. Williams received a Hancock Bank Leo W. Seal Innovative Teacher Award last year to purchase a virtual golfing range to explore math on the greens. The St. Patrick Catholic High School Golf Team has an upcoming state golf tournament. They are trying to buy a few sets of golf balls for their team that will give them max performance and lead them to victory over their competition. You will need to choose four different types of golf balls to purchase for the tournament. Your team is looking for golf balls that reach the highest max height at its trajectory. You will need to determine the max height at which the golf ball will reach after being hit by a driver. You will need to determine when (time in seconds) the golf ball will hit the ground. 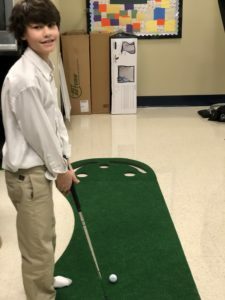 The team’s golf coach is looking for golf balls that reach a height greater than 76 feet and that will stay in the air for more than 4.6 seconds. 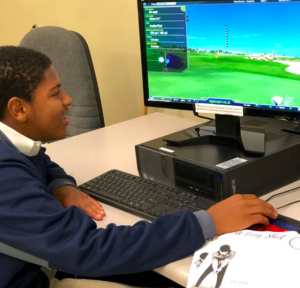 Students also had to generate a model of the paths the golf balls will take on the course through drawing, building or computer-generating models. 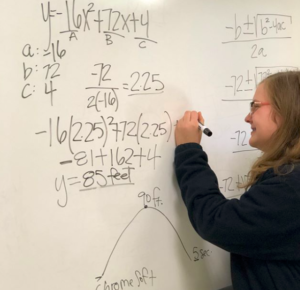 Students were provided quadratic functions to represent the parabolic path of a typical golf ball as well as equations to find the height and time. Check out photos from the experience below!